I’ve now seen that you can buy a copy of “Microsoft Office Home and Student 2007” for around £100. It includes Word (Docs), Excel (Spreadsheets), Powerpoint (Presently) and OneNote (Notebook), and is licensed for use on up to three computers providing they’re not used for commercial purposes. It’s taken well over a year, but last week we finally made up our minds and purchased a Humax PVR-9200T. Goodbye E180 VHS tapes; Hello 160GB HDD! Coco Riley got his back in December 2005 when it was reasonably new technology and apparently the best PVR available in the UK. I figured I’d sit back and wait for a better, cheaper model to come along – but 15 months passed and I was still left waiting! Luckily, a couple of weeks ago, I got a tip-off from the elusive blog commenter known as “S Crayon” telling me to buy it from Hughes Direct’s Which? associated website – www.which.hughesdirect.co.uk – where you can get several pounds off their already-reasonable prices. He’d just bought one from there after consulting the Digital Spy forums. When I bought it on Sunday, it cost me £170.99 plus £6 P&P. Today it’s going for £163.90! And whilst I was a little worried because I hadn’t received an order confirmation email, it arrived today, just as promised. I’ve no idea what “to preve” means but managed to work out they were trying to tell me something. I guess they’ve had a lot of customers complain about the front panel being scratched, only to find that it does have a very inconspicuous “protective film to preve” after all! I’ve only used it for a couple of hours tonight but I’m very happy with it. Not only does it give me loads features than my old Freeview box and VCR put together, but the picture quality and signal also seems to be much, much better. With our old Philips Freeview box, half our channels would cease to work at around 8PM every night and we never found out why (presumably some interference from some electrical equipment somewhere) but we’ve not had any problems at all with this box tonight! “S Crayon” also tells me that there’s a software update due for it very soon that will add Series Link functionality like Sky+ and a stored EPG instead of loading it every time you switch the box on. This thing just gets better and betterer! My only grumble? I should have bought one 15 months ago! We flew with Thomsonfly from Robin Hood Airport for about £69 return each (including taxes and charges). We got extra leg room and the plane had leather seats. Other than that, the flight was the usual boring episode. Having reached our destination, we bought two transfer tickets that allowed us to use both the bus and the Metro to reach the centre of Prague. One of the reasons we chose to visit Prague at this time of year was to visit the Easter markets in the Old Town Square and Wenceslas Square which were taking place between 24th March and 15th April this year. So, after checking in at our hotel – Tulip Inn (Prague Terminus) – we walked to the Old Town Square market and had a pork baguette from one of the stalls before getting our bearings. In the evening, we headed over to a restaurant that had been recommended by someone at work. We’d found it earlier in the day and decided to go back and eat there at night. By mistake, we ended up at a completely different restaurant, and the penny only dropped when I realised that all the food on the menu seemed to be French or Asian inspired rather than typically Czech... meaning we were in a nearby restaurant called Nostress which we’d also seen earlier in the day. Nostress Asian French Fusion restaurant. Described as being French Asian Fusion, most of the food on the menu was more Asian than French. For starters, I had Dim-Sum (a selection of Chinese steamed dumplings) and Suzy had Piquant Wonton Soup with Chicken Dumplings. For main course, I had Beef Peanut Curry with Jasmine Rice (since they had no Chinese noodles) and Suzy had Grilled Halibut Fillet with a Saffron Sauce and Roasted Vegetables. All dishes were excellently presented and cooked to perfection. Most Asian restaurants seem to be lacking good deserts, but I guess being a French Asian Fusion restaurant means you can serve whatever deserts you like, so Suzy had a Warm Pear Croustillant with a Chocolate Sauce and I had my trusty favourite Crème brûlée. Three courses for two, including a bottle of wine and a bottle of still water cost 2115 Kc (about £50) – not so cheap for Prague but very reasonable by UK prices! 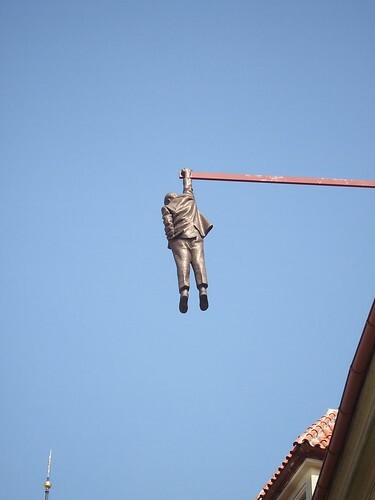 A bronze statue hanging from one of the buildings representing the fall of communism. To get a better overview of Prague, we decided to take the 3½ hour Grand Walk (The Best of Prague) with Prague Walks which took us through the Jewish Quarter, Old Town, New Town, Wenceslas Square, Charles Bridge and up to Prague Castle. One of the advantages of going on a guided walk is that you’re shown things you probably would’ve missed otherwise and told what they are, like the hanging statue you can see here. 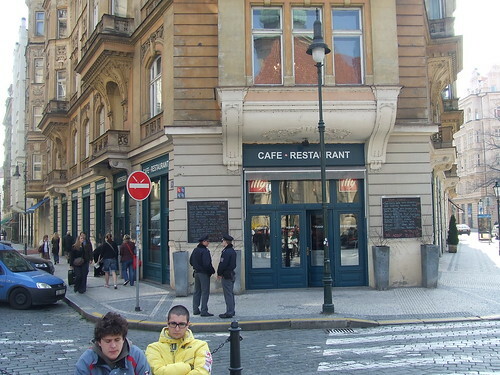 For lunch we tried to find a typical Czech meal and ended up at Hotel Cerný Slon. Mine consisted of pork knee, pork shoulder, pork sausage and bacon (and probably some more pork) with a selection of dumplings and cabbage. Suzy had roast duck with a similar selection of dumplings and cabbage. In the afternoon, we went back to the Easter markets in the Old Town Square and after the meat overload at lunchtime, we decided to settle for pizza and pasta at a small Italian restaurant called La Scala. 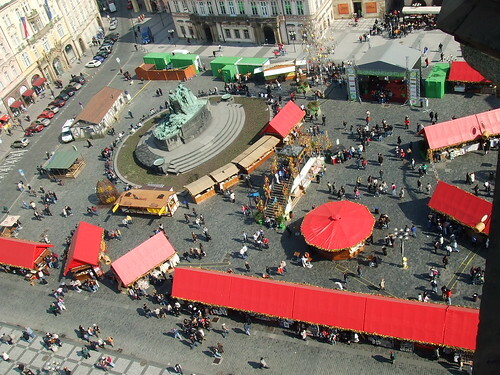 The Easter market in Staromestské námestí (Old Town Square) taken from the top of the clock tower. In the morning, we visited Wenceslas Square again (managing to avoid Debenhams and Marks & Spencer) and went up the tower of the Prague Astronomical Clock and saw some amazing views. Not quite in the mood for a huge bratwurst sausage from the market, we visited a small restaurant (which I think was called Bella Vita) where I got to sample 1kg of marinated pork ribs and Suzy tried a Prague cheese platter. In the evening, we finally managed to eat at the restaurant we were meant to visit on Monday! Kolkovna describes itself as being “based on a combination of the tradition and uniqueness of the Pilsner Urquell brand and Czech cuisine fused with modern gastronomy.” The starters of Beef Tartar Steak and Beef Broth were both fair. Having had such a large Czech lunch, I wasn’t really in the mood for another large, meat-heavy Czech meal, so for main course I ordered the Rabbit in Garlic and Onion (roasted rabbit legs with spinach and roast potatoes with bacon) which was unfortunately accompanied by “garlic with spinach” rather than “spinach with garlic” and was far too salty, as was Suzy’s Moravian Sparrow (pieces of roast pork with garlic and onion, bread and bacon dumplings, white and red cabbage). The waiter wasn’t the most helpful and the service overall wasn’t great either. Sadly, both the food and service here was disappointing but 1222 Kc (about £30) for two courses, a bottle of wine and a beer seemed like a reasonable price to have paid. Suzy Tours says: And here ends the tour with a view of the Charles Bridge. On our last full day in Prague, I spent the morning on another guided tour – this time with Suzy Tours (aided by her Lonely Planet guidebook) – which took us back up to see Charles Bridge again. For lunch, walked back to the Old Town Square and had a bratwurst in a baguette and a chicken panini from the Easter market before doing a bit of souvenir shopping. Sick of meat, dumplings and cabbage (despite having only eaten Czech food for two or three meals) we luckily found a fantastic Thai, Burmese and Indian restaurant called Orange Moon for our last evening meal in Prague. They did a great Tom Yam Kung soup and Thai Fish Cakes for starters and equally delicious Thai-Green-Curry-like and Pad-Thai-like main courses (although I can’t remember exactly what they were). 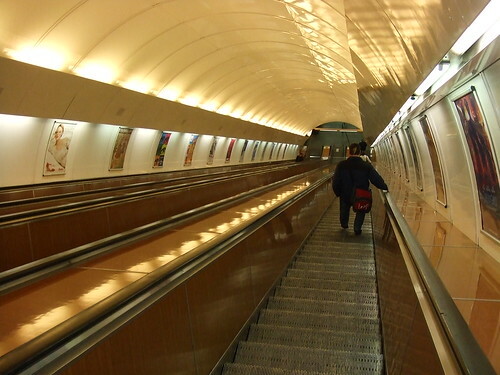 The escalators leading down to the Metro platform at the Námestí Republiky Metro station on Line B. After checking out of the hotel, we caught the Metro back to Zlicín and visited the Metropole shopping centre (and almost went to Ikea but it was a bit too far away) before making our way to the airport for our return flight home. Despite this post being a little on the long side (please accept my apologies) we didn’t feel like we actually did that much whilst we were in Prague, meaning we not only had a brilliant, well-deserved break but also that we can definitely go back again in a few years and see some different sights. Having said that, four nights is probably too much for a short break unless you’re really going to cram in the sightseeing, but I’d definitely recommend visiting Prague if you get the chance!